"Beginning of the end" as oil companies cut back on spending? “Such an approach is likely to lead to an eventual drop in oil production. ….I encourage readers to watch the original hour-long presentation at Columbia University…..
….Another piece of evidence that the Demand Model is wrong relates to the assumption that social tastes have simply changed, leading to a drop in US oil consumption. Kopits shows the following chart, indicating that the major reason that young people don’t have cars is because they don’t have full-time jobs. ….“Supply Growth” is the limiting factor in recent years, because the amount of extraction is rising only slowly due to geological constraints and the number of users has risen to the point that there is a shortage. Kopits presents data showing how badly the big, publicly traded oil companies are doing. The above information is worldwide, not just for the US. ….The amounts this time are for the industry as a whole, including “NOCs” which are government owned (national) oil companies as well as IOCs (Independent Oil Companies), both large and small. ….According to Koptis, the cost of oil extraction has in recent years been rising at 10.9% per year since 1999. (CAGR means “compound annual growth rate”). ….Basically, Shell is cutting back. It no longer is going to tell investors how much it plans to produce in the future. Instead, it will focus on generating cash flow, at least partly by selling off existing programs. 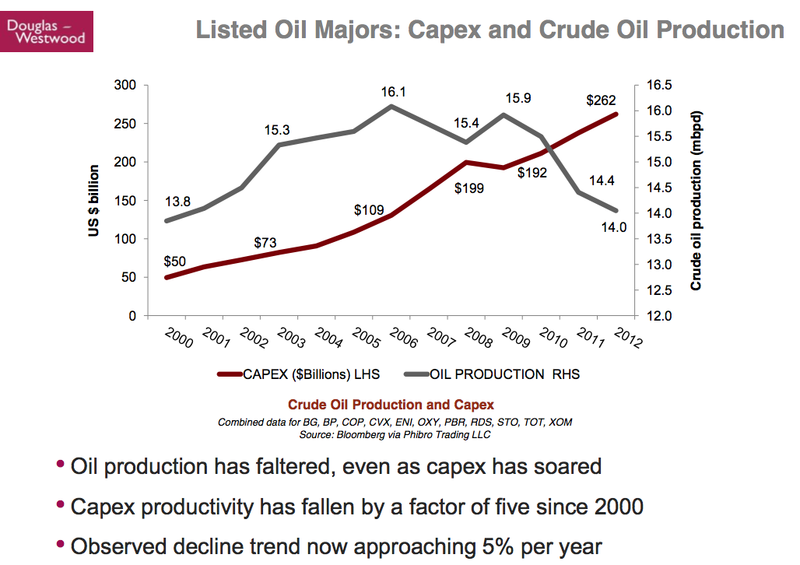 ….The above slide shows that conventional oil production peaked in 2005. The top line is total conventional oil production (calculated as world oil production, less natural gas liquids, and less US shale and other unconventional, and less Canadian oil sands). To get his estimate of “Crude Oil Normal Decline,” Kopits uses the mirror image of the rise in conventional oil production prior to 2005. He also shows a separate item for the rise in oil production from Iraq since 2005. The yellow portion called “crude production forward” is then the top line, less the other two items. It has taken $2.5 trillion to add this new yellow block. Now this strategy has run its course (based on the bad results companies are reporting from recent drilling), so what will oil companies do now? ….Above, Kopits shows evidence that many companies in recent months have been cutting back budgets. These are big reductions–billions and billions of dollars. ….While demand constrained models dominate thinking, in fact, a supply constrained model is more appropriate in recent years. Gail’s Observations: An obvious point, which I thought I heard when I listened to the presentation the first time, but didn’t hear the second time is, “Who will buy all of these assets on the market, and at what price?” China would seem to be a likely buyer, if one is to be found. But when several companies want to sell assets at the same time, a person wonders what prices will be available.